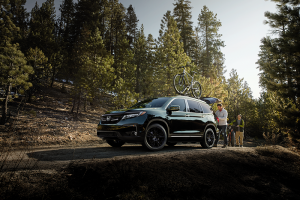 The aggressive and refined 2019 Honda Pilot has finally arrived and isn’t afraid of the attention. The exterior of the Pilot is both rugged and refined, and shows off how Honda is redefining the modern Family SUV. Everywhere you look their is advanced capabilities within the Honda Pilot, including available 8-inch Display Audio touch-screen with Apple Carplay integration and Android Auto integration. The Pilot makes communicating with rear-seat passengers easy, using the available Cabin Talk in-car PA system. 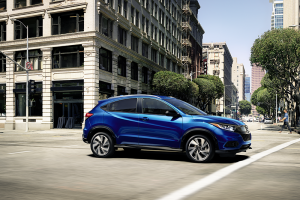 The pilot also comes standard with the Honda Sensing, a suite of safety and driver-assistive technologies designed to help by alerting you to things you might miss while driving. Not only does it come with incredible features it has recently earned the 2018 Insurance Institute for Highway Safety (IIHS) highest overall safety rating of Top Safety Pick. Honda’s 2019 HR-V has a look that stands out. The sporty and versatile 5-door subcompact SUV has finally hit the roads this summer. The new Sport grille with an exclusive black honeycomb patter adds aggression and attitude to the face of the HR-V. The HR-V has a stylish set of 18-inch Sport-exclusive alloy wheels which adds to the sporty look of the HR-V. Everything you need is within reach, including an available 7-inch Display Audio touch-screen and an automatic dimming rear view mirror. The 2nd row of the HR-V has greater cargo space and versatility, which adjust to accommodate just about anything. Honda Sensing® is also available as standard equipment on EX and higher trims, making Honda’s safety and driver-assistive technology available on every Honda model. 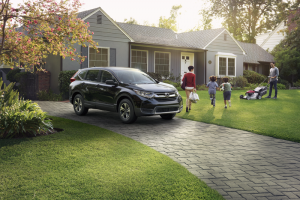 Over the past 20 years the Honda CR-V has been America’s best-selling SUV. The design of the Honda CR-V raises the bar. The distinctive headlights,taillights and sporty, sculpted panels create a design that has set the bar for the SUVs. The CR-V offers premium features including Apple CarPlay and Android Auto integration as well as an available Honda Satellite-Linked Navigation System, Honda’s safety driver assistive technology suite, and Honda sensing which is standard on EX and higher trims. From city lights to countryside, it looks great in any environment! Visit LaFontaine Honda to test drive the new 2019 Honda Pilot, 2019 HR-V and the 2018 CR-V.